If you are using VST plugins or Audio Units and need a set of all purpose audio effects (although advanced, but easy to use), then Flex FX might be a good choice. Flex FX contains 7 easy to use plugins, which can be used for a variety of purposes. A host for vst plugins. The plugins are available as Audio Units on Mac OS X and VST plugins on Windows. Each effect can be used as an insert or send effect. All, except the Ensemble and the Delay, have their own dedicated LFO (Low Frequency Oscillator), which can modulate the effect. The LFO can be synchronized with your host (sequencer), provided that it supports sync. 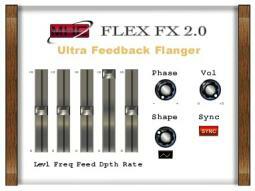 Flex FX is a set of VST plugins for Windows or Audio Units on Mac OS X. They can be used with VST compatible programs on Windows, such as Cubase DX, Acid Pro, Logic and other programs, which can execute VST plugins. Or they can be used with AU compatible programs on Mac OS X, such as Emagic Logic etc. Lets you control Winamp player, Internet browser, execute files, open URLs. Pantech Flexus 03 Concept Cell Phone. A cell phone that you can't buy. Qweas is providing links to Flex FX 2.0.3.1 as a courtesy, and makes no representations regarding Flex FX or any other applications or any information related thereto. Any questions, complaints or claims regarding this application Flex FX 2.0.3.1 must be directed to the appropriate software vendor. You may click the publisher link of Flex FX on the top of this page to get more details about the vendor.